These are darling pins made from buttons. I like how some of them are layered. These are bright and cheerful.. how cute would a red, white and blue one be for July? 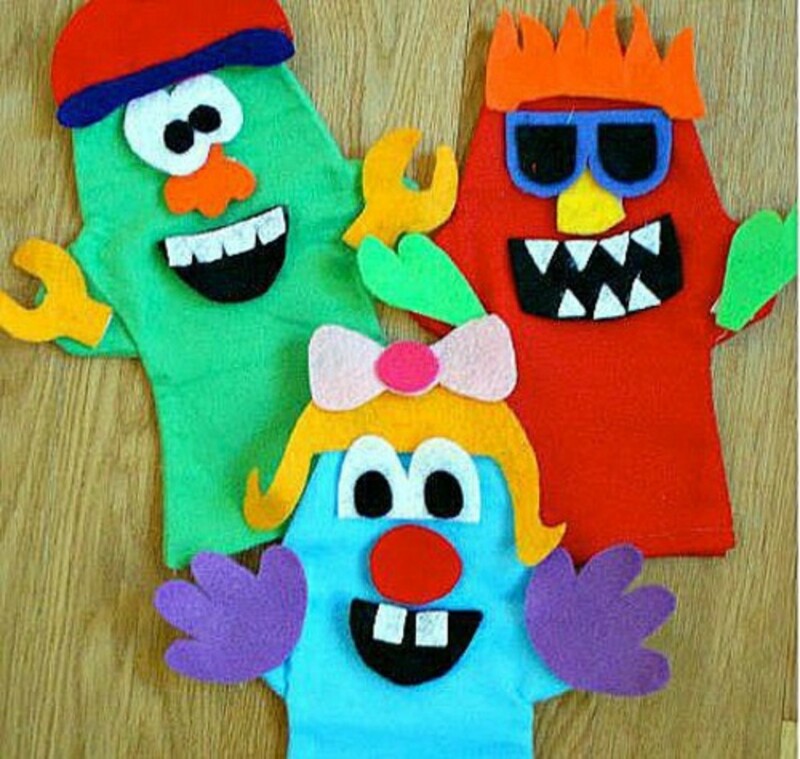 As easy as these are to make, they could even be a great kids craft! Artsy Crafty Babe shares the easy, photo illustrated tutorial. I can't help but love this.. 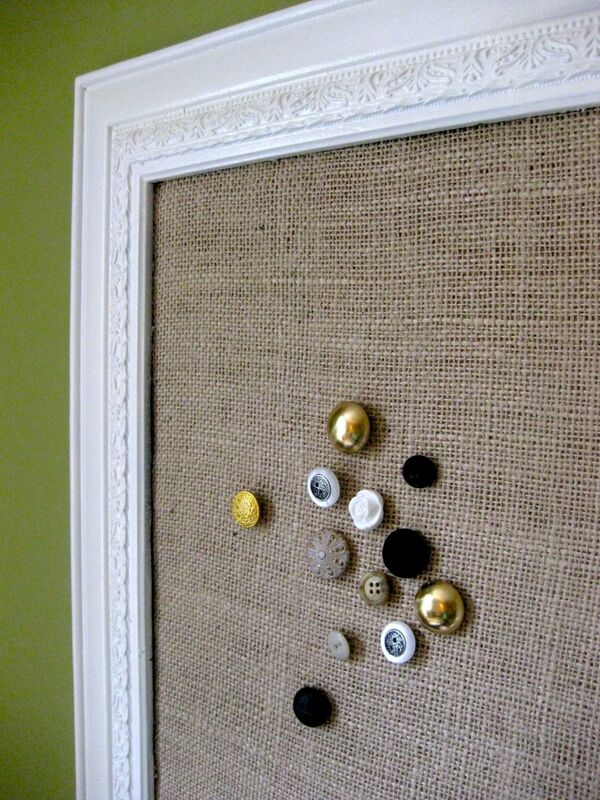 I love the rustic look of burlap and the vintage looking buttons really make great thumb tacks! This is such a neat bulletin board! Go to in the tweeds to see how she made the button thumb tacks.. There is even a link on the post showing how she made the framed bulletin board! 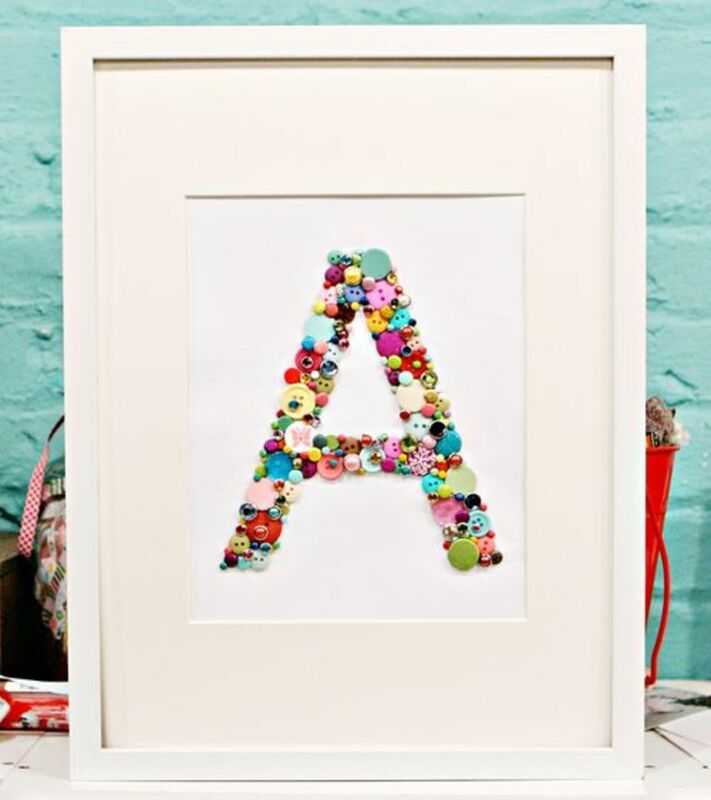 Isn't this framed A made from buttons so precious? I love it.. This would look precious any bedroom but especially a little girls. 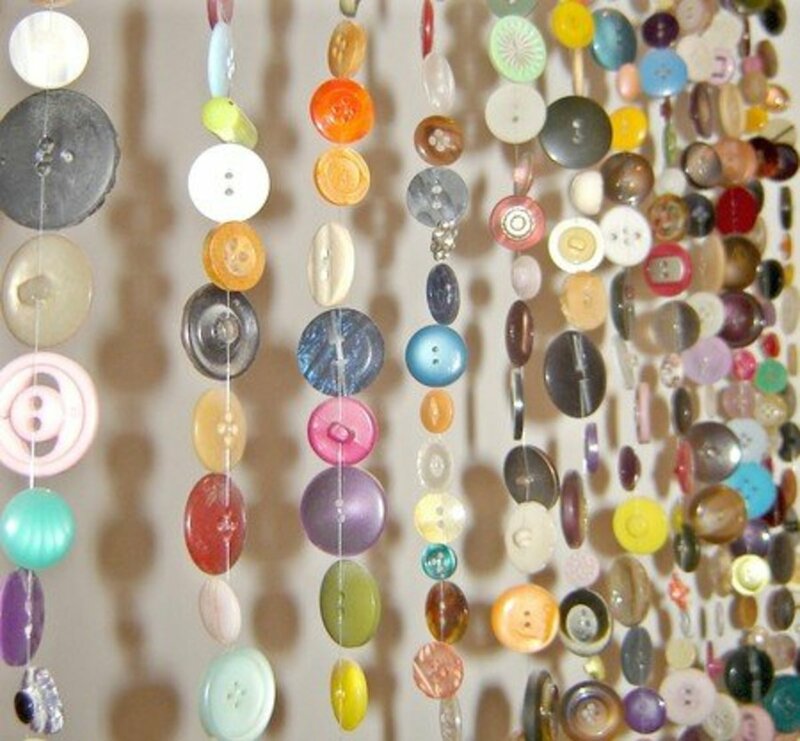 If you have a lot of various sized buttons, this could be a great project for you. Go to Baby Lifestyles for the tutorial! 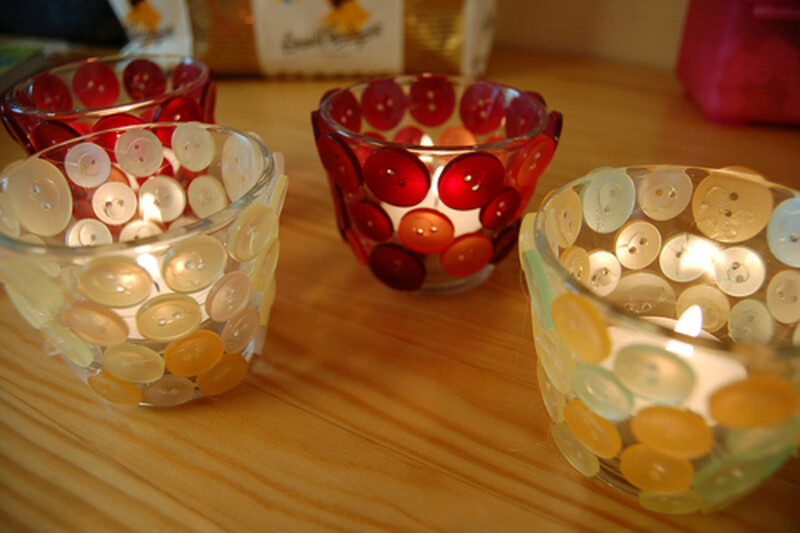 I like the look of the candle burning in these clear candle holders with buttons mounted. 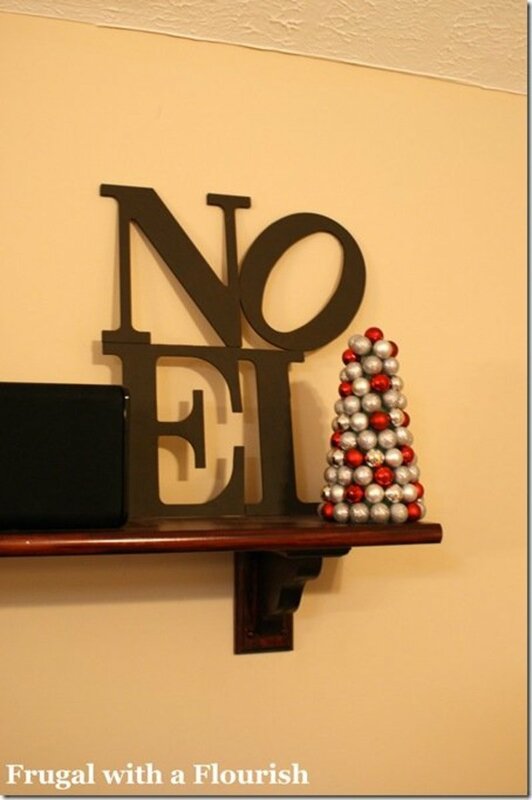 I think this is pretty clever. I never would have thought to glue buttons on like that. Because the buttons are not completely opaque, the fire glows through the buttons which makes them so pretty. Go to iHanna's Blog to see how she did it and lot's more beautiful glowing button photos. 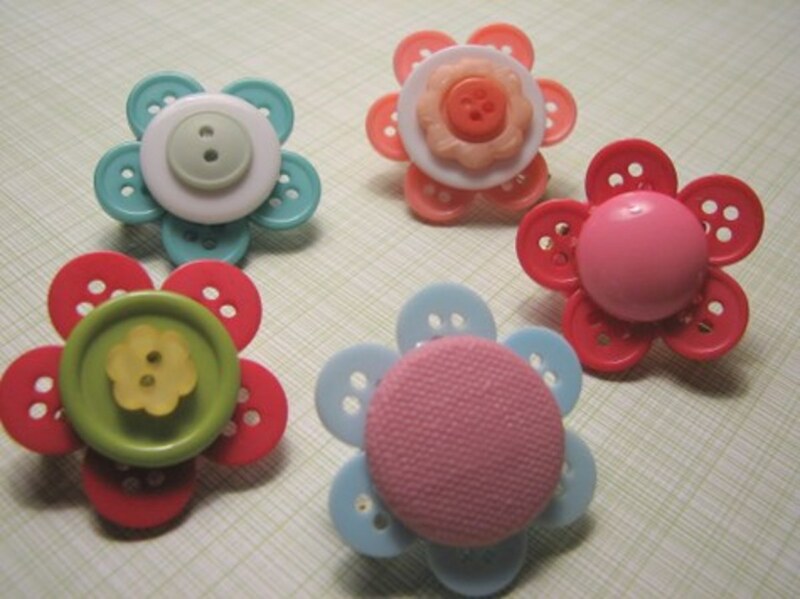 Vintage button magnets.. another great idea! 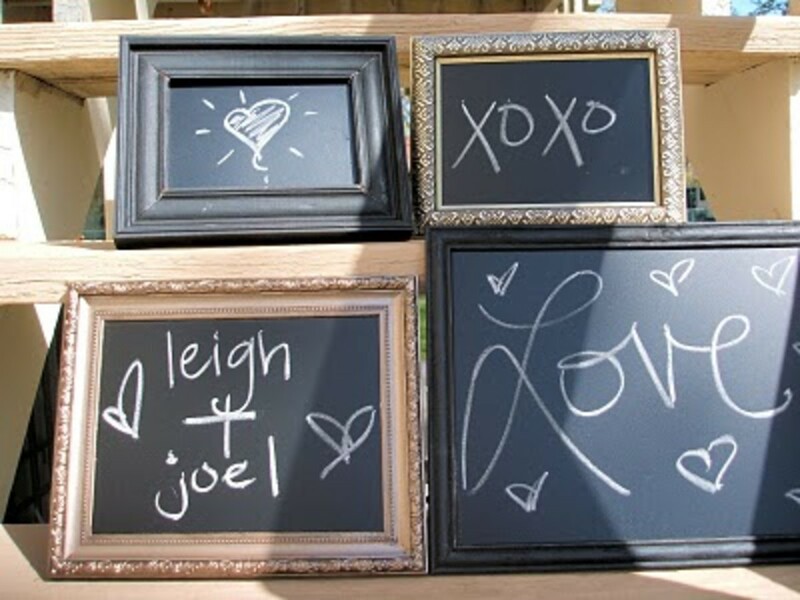 You could make a framed metal piece and stick these to it for a nice little bulletin board like the one above.. You could even get a square metal piece and paint with chalkboard paint- that way you can have a chalkboard/magnetic board. I saw chalkboard paint in a spray can the other day! You would never guess that these two little containers used to be small glitter pots! How did they make them look so "vintage" I guess is the word. It's amazing!! These were sprayed with spray paints- can you believe it? These are super small but very, very cute. Go to Dollar Store Crafts to see more. 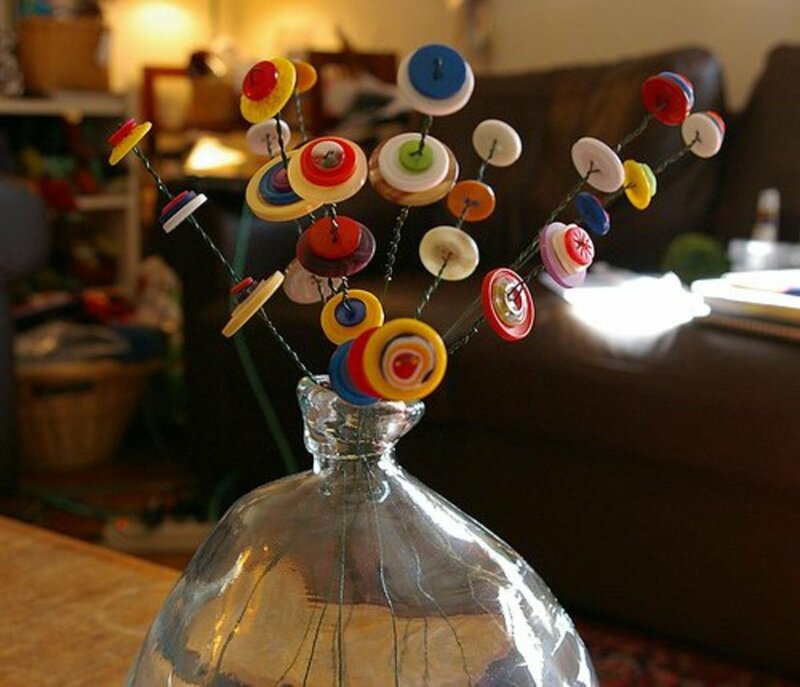 Look at this very pretty button bouquet. I have always loved these and they are super easy to make. 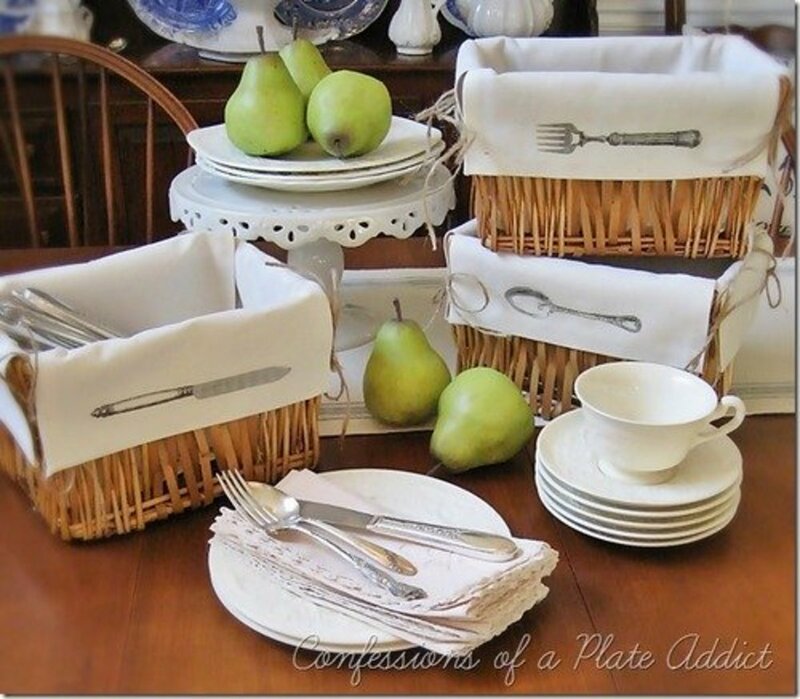 You basically just need some wire and buttons and jar or something to put them in. 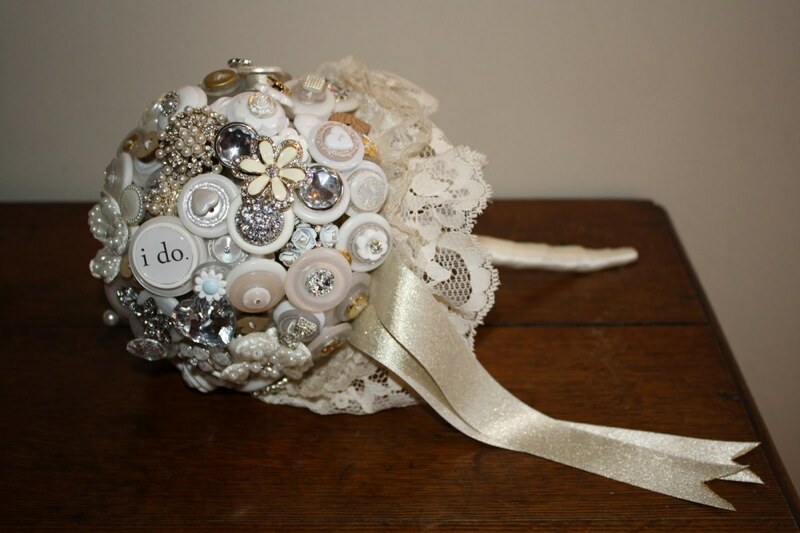 Go to Sunshinewalks to see a link to the tutorial that inspired her to make this beautiful button bouquet. Oh my gosh, aren't these button curtains adorable? I immediately thought about making button garland when I saw this. There wasn't a tutorial posted but it looks as if there were buttons glued onto fishing line probably with a glue gun, one button after the other. It looks pretty simple to do and it's so gorgeous!!!! I love this perpetual button calender. All you have to do is move the buttons around every month. You personalize it any way you want and choose your own colors. This would make a nice gift for someone, too. Go to Craft for the awesome tutorial with lots of great photos. 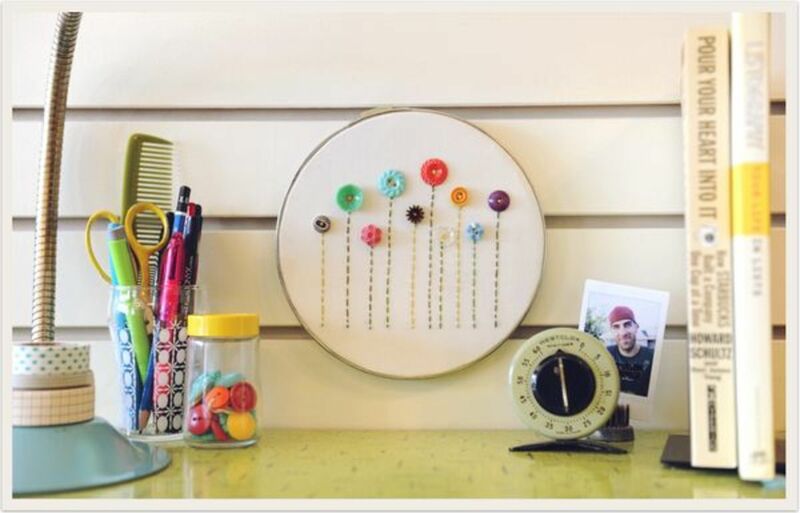 I saw this in a photo on one my recent hubs about embroidery hoop wall art and I looked high and low to find it! I love these flowers mounted on this hoop with the stitch lines. This is so darned cute! Go to Freckled Nest for a very nice tutorial. Be sure to check out the other projects on the site.. this site has some really great tutorials. This is a real bouquet used in a wedding and I think it is just precious. Did you notice the one button that says " I do?" This is a nice change from the everyday flower bouquet plus it's something you can really hold on to for years to come. Go to a million dresses for a really nice photo illustrated tutorial. Well, these are just as cute as a button! Buttons make a great accessory for anyone... These are obviously super simple to make. You can use casual buttons are super fancy buttons, too! Even though you could use plain bobby pins, they do sell bobby pins with little round pads on them for mounting things on. Check Etsy or Artfire if you are interested. 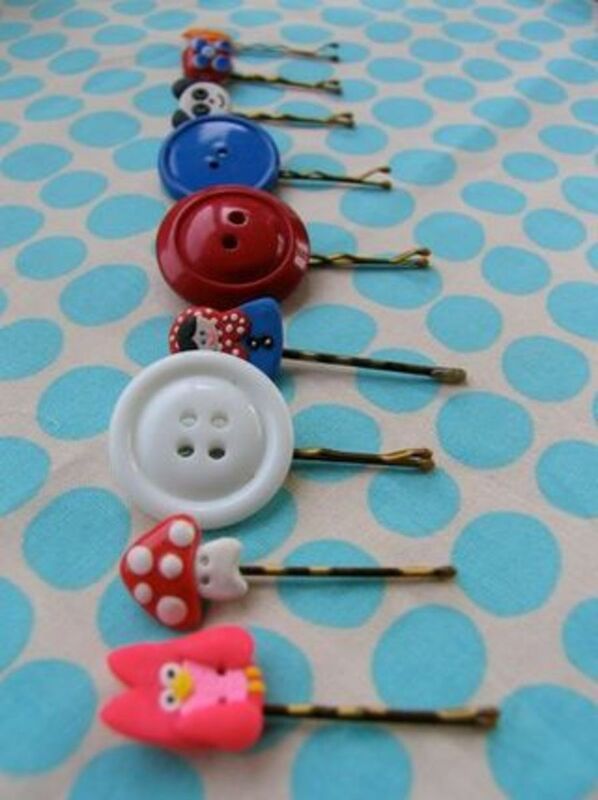 Go to One Crafty Mumma for the 5 minute tutorial on how to make these button bobby pins. I love hearts of all shapes and sizes.. this one made with red buttons is DARLING!! LOVE it! I love how it's made with buttons in different shades of red.. really pretty. This would be perfect for Valentine's Day. Go to I really should be sleeping.....(I can so relate!) 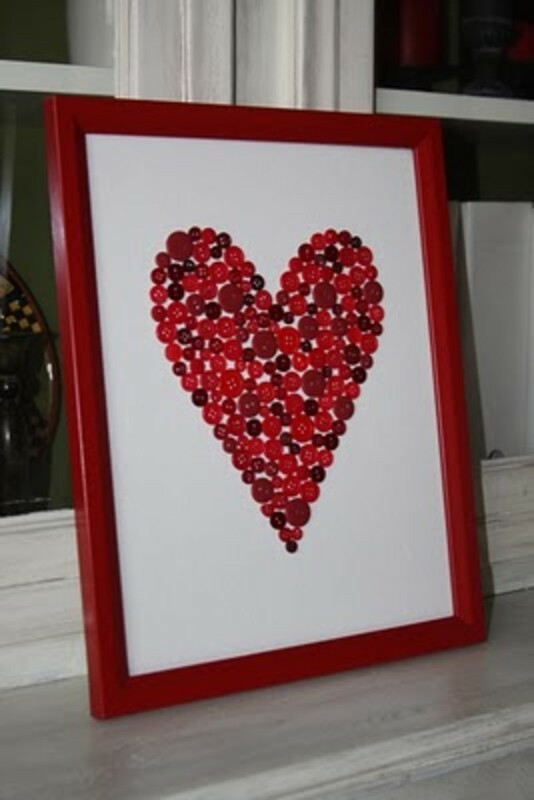 to learn how to make this framed red button heart. It's a great tutorial complete with photos. The Fleur de lis is such a beautiful decorative symbol. I love how it looks made with buttons... I can picture a pretty cross made out of buttons, too. The Fleur de lis is actually a symbol of an Iris or Lilly, according to Wikipedia anyway. 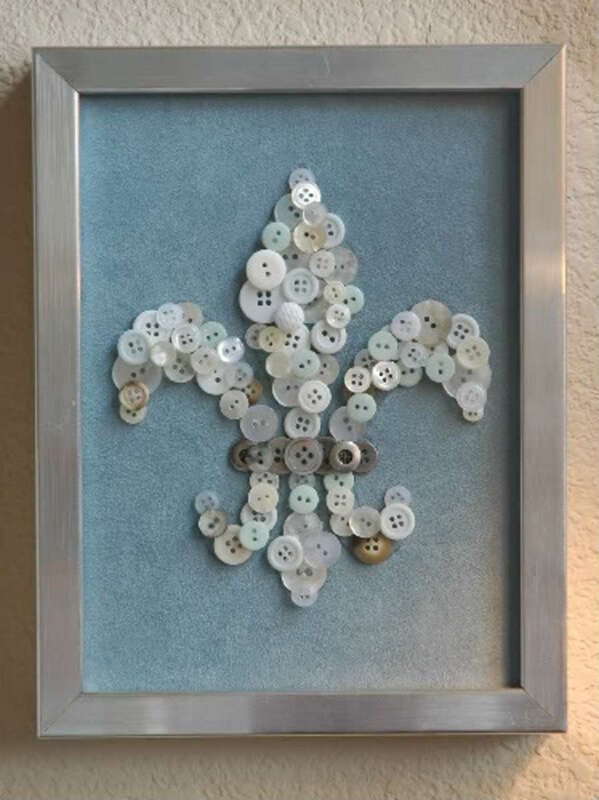 Go to Living with Lindsay for a great tutorial showing you how to make this button Fleur de lis! 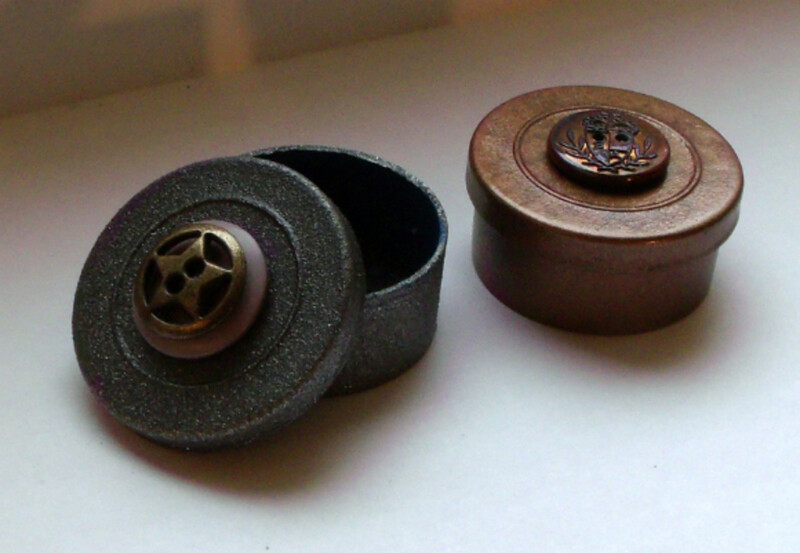 You can buy a button covering kit to make your own cloth covered buttons or just use some that you already have on hand. I think these are simple yet so adorable. She shows on her post how they can be used to dress up plain throw pillows and such. Go to Sania Pell At Home to see her tutorial. 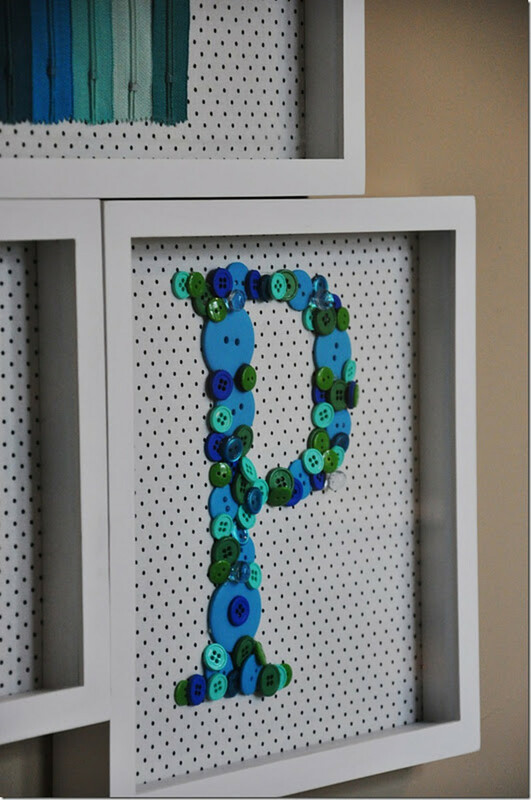 Wow, these green and blue buttons mix perfectly together to make this beautiful P in a shadow box. I think it's gorgeous. Be sure to look at the post to see the rest of the grouping. Go to Living with Punks (haha, love that name!) to see her very informative and easy to understand tutorial complete with illustrative photos. I can't say enough about this cute button lamp. I love all the different sizes and colors of buttons that are mounted to this shade. It reminds me of stained glass almost with all the different colors and how some of the buttons the light shines through and some of the others are more opaque. I found this button lamp at Pinterest via Kimberly Josephson. There was no tutorial but it looks easy enough to make. 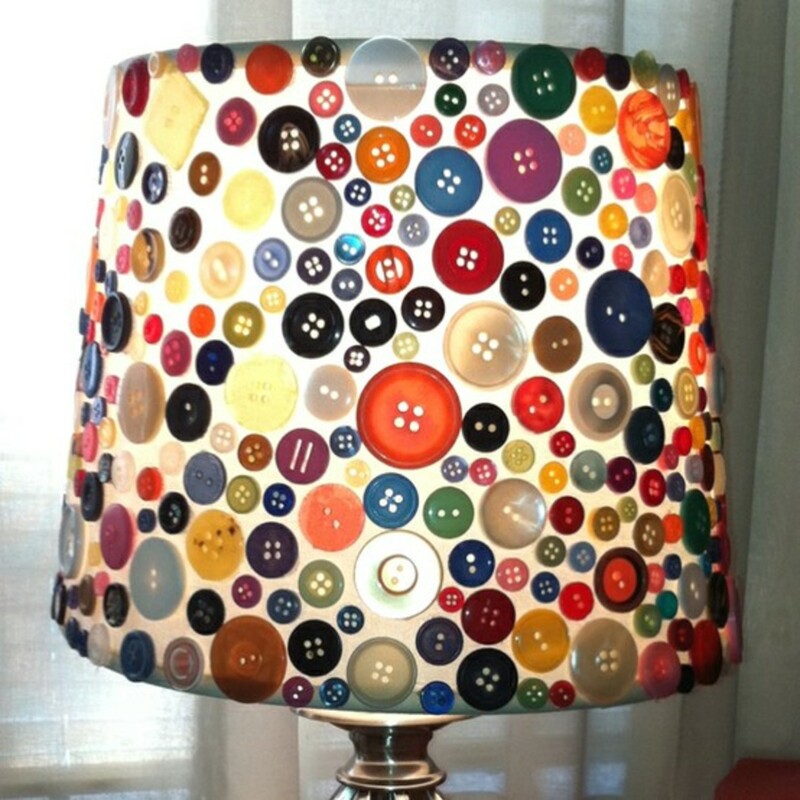 Just glue some buttons on a lamp shade! I have always been fond of the colors black, white and red together. That is why these shrinky dink buttons really got my attention. Not to mention the awesome images on them. You can trace whatever images you want plus she shares some image templates as well. I think these would look really cute just lined up in rows in a frame, myself. Go to SCISSORS.PAPER.WOK to see how she did it. This is a perfect tutorial because she gives you valuable tips along the way. 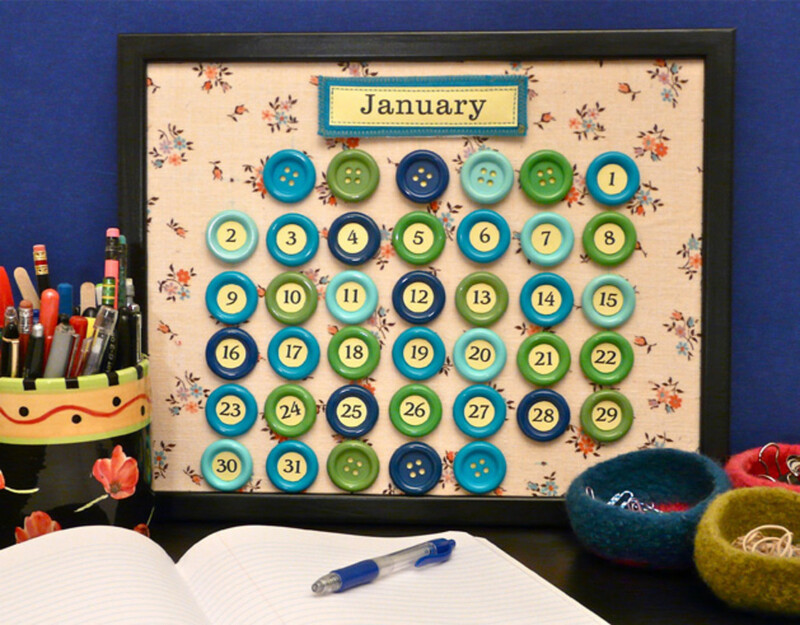 She shares every detail through her own experience with trial and error on how to get a finished project just like the buttons in the picture. Fabric covered buttons definitely are back in style. 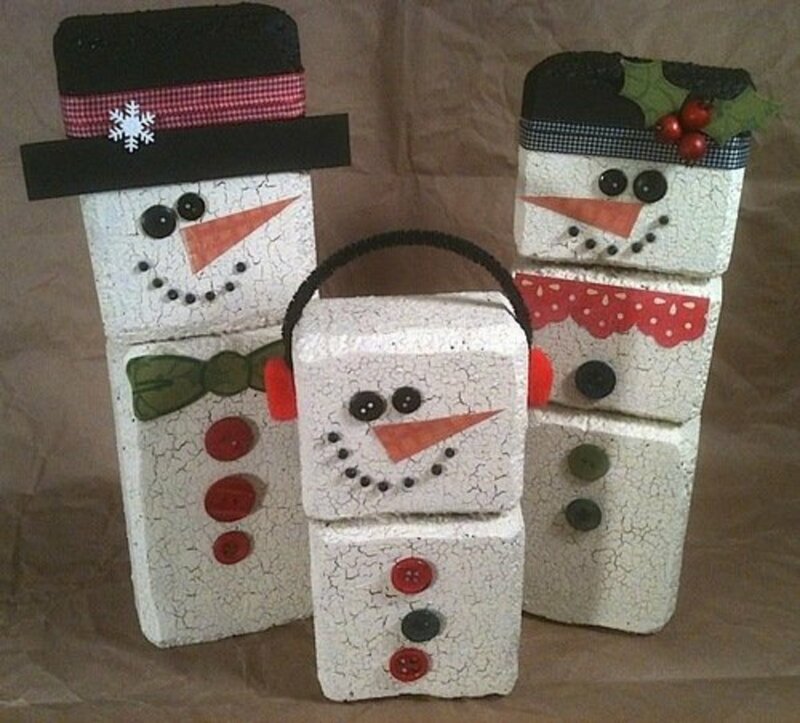 I am seeing them more and more on cute handmade crafts. 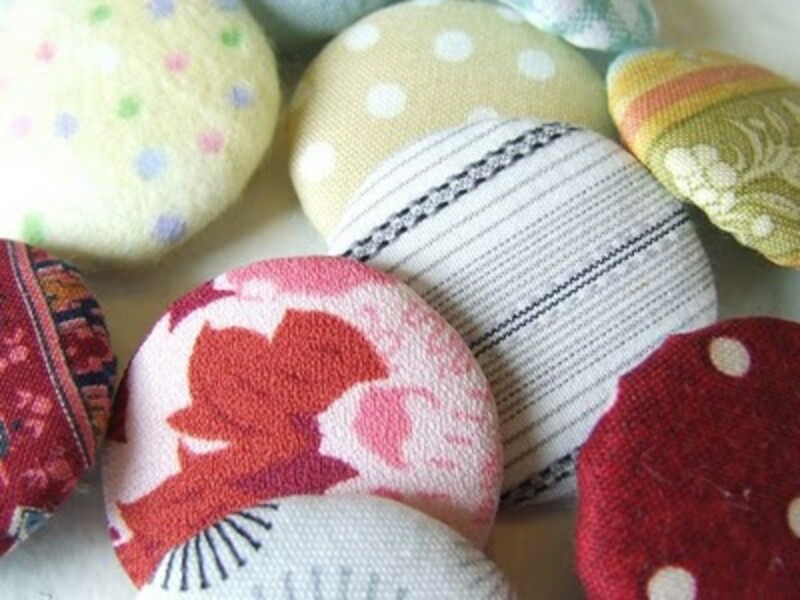 Have you ever wanted to make fabric covered buttons? What I thought was clever about these buttons is they were made from things she has around the house. 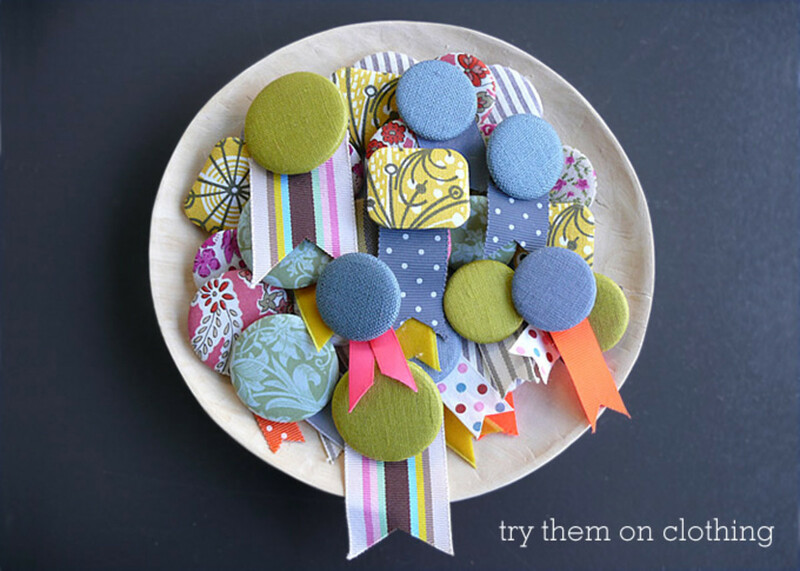 Go to Michele Made Me to learn how to make these cute fabric buttons. You may already have everything you need on hand. Button rings are the cutest. Since buttons come in so many different styles, you can make these as casual or as fancy as you want. These were made using ring blanks which you can find at etsy, ebay or artfire in bulk for fairly cheap in different colors and sizes. 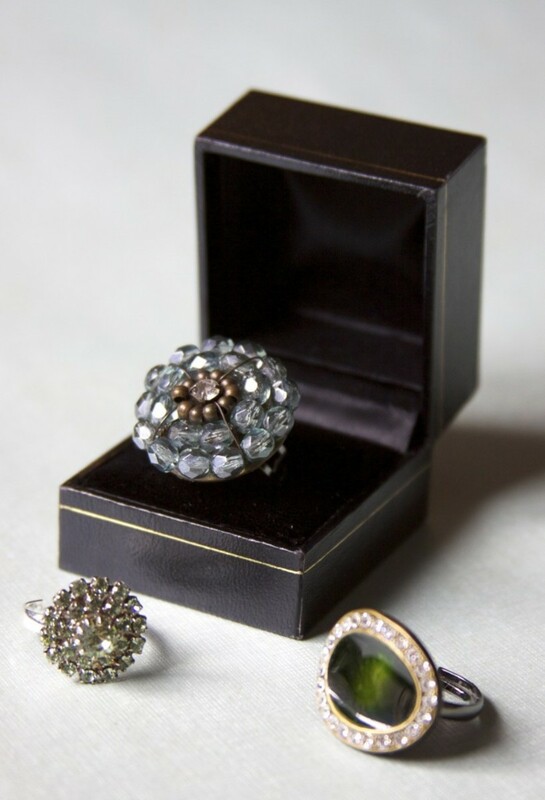 Go to Momster for the awesome tutorial on how to make these button rings! This isn't actually a craft using buttons but it is a way to refurbish some plain buttons that you may not have known what to do with. Maybe you have a big jar of plain white buttons that you would have used by now if they had been different colors. Have no fear-- spray paint can fix anything and did you know the vast array of colors spray paint comes in these days? What is really amazing is the freshly painted buttons look like they have been that color all along. Go to Capture the Details for a super photo illustrated tutorial on how to spray paint buttons. Any Comments, Feedback or Ideas? aesta1- Thank you! I'm glad you enjoyed the tutorials. 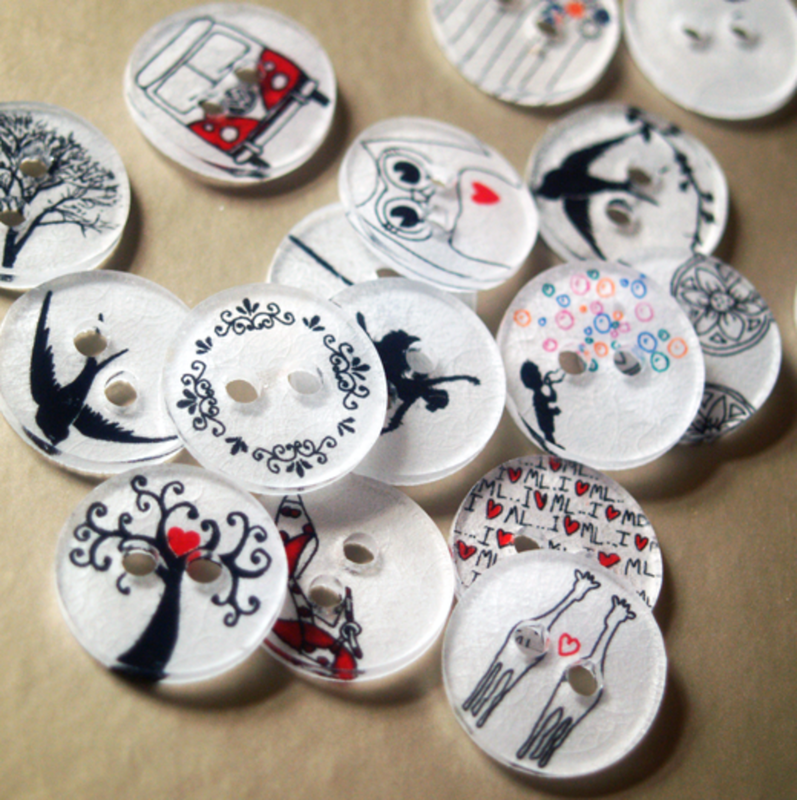 There are so many cute things you can do with buttons.. for sure! Wow, these ideas are great. I never thought you could make such wonderful things out of buttons. I especially like the candle holders and the curtains. Fiona Jean McKay- Thank you so much for dropping by! Love the tutorial. I have some vintage buttons I am going to use to make necklaces with, but I loved to see the other ideas you presented here- especially the magnets and pins. Thanks for the inspiration. Au fait- Thank you so much and I really appreciate the vote and feedback! There are a few of these that would be great for kids especially the framed letter ones that have the buttons filled in...I bet they would have a blast doing some of these. Thank you so much for stopping by! This is another great hub Jamie! 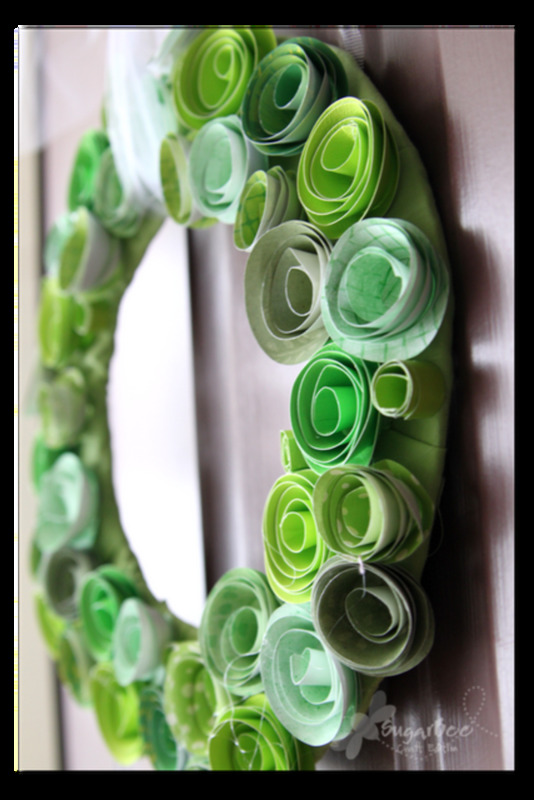 I love crafts, especially crafts that are relatively inexpensive, quick, and easy. 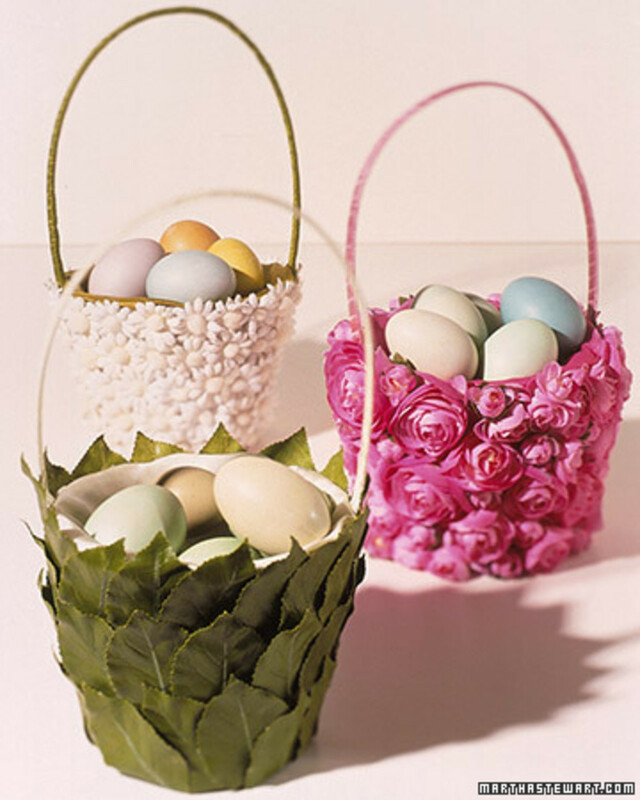 There are some great ideas here that would be great for kids with a little craft talent to make for Mother's Day, which is just around the corner. I really liked the thumb tac idea. Who doesn't use thumb tacs? These thumb tacs add character to your bulletin board. Thank you Rose, I appreciate that! I have included your awesome tutorial round up in a tutorial round up on my blog today. Enjoy and have a great day! Very cute ideas on how to use buttons. I never can throw away buttons, but until now haven't found any great uses for them. I love the photos of the completed projects! Voted up! Cute, cute stuff. You make me want to paint buttons, and get out my button collection. Thanks much for another great resource. Love button crafts. Those are some interesting ideas on how to use buttons. I love the perpetual button calender. Thanks for sharing. Of course I love this hub!! 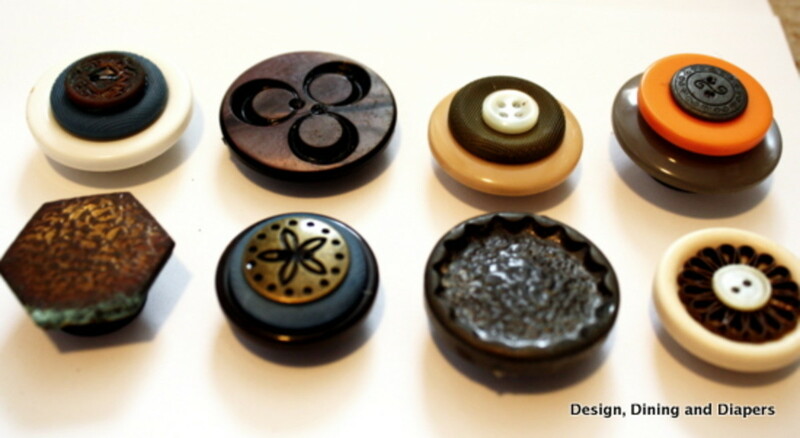 You have rounded up so many great button tutorials! Off to check out the perpetual button calendar. Wonderful ideas how to use buttons. What a cute and perfect thing it is possible to creating using buttons! Thank you for sharing.